In Morocco, drivers seem not to follow traffic laws. Scooters are the most popular form of transport, and they zoom along the highways and through the tight alleys of Marrakech with equal carelessness. According to Wikipedia, the rate of traffic-related death in Morocco isn't particularly hig. I cannot fathom why. Transport for the whole family. Letting the 8-year old drive is definitely a good call. Here are some other things I observed and/or learned while in Morocco. The Moroccans break fast like the French - as if it is just a warm up to lunch, or maybe an afterthought of dinner, as a opposed to an actual meal. Most often, breakfast consisted of bread with jam, and coffee or hot chocolate. As my growling stomach would have told you every day at 10 o'clock if you asked it, this can be quite insufficient for an active day. Luckily they do other meals better. The traditional way of cooking is called 'tajine'. A tajine is a special clay dish that you fill with potatoes, vegetables, and meat, and then cook over charcoal with a conical lid. We ate a lot of different tajines in the Morocco. 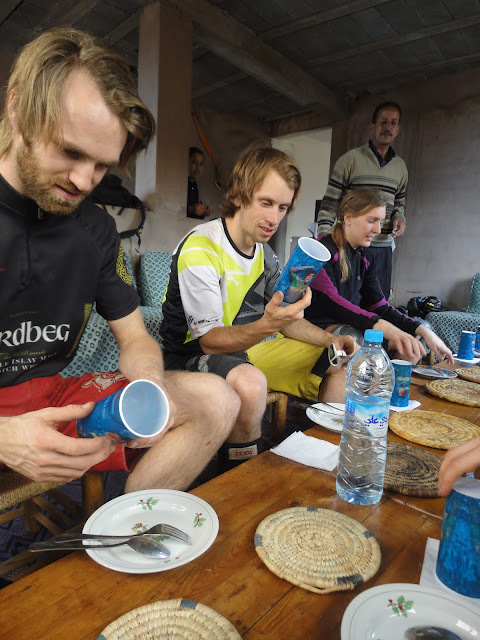 By far the best were those served to us in a traditional Berber house in the Atlas Mountains. This particularly family does bustling business letting tourists into their house to poke around, and then serving them lunch. Audun, Øyvind, and Ingvild inspect the Pepsi soccer-themed cups we got. Host Mohammed looks on. Apparently the host, Mohammed, has been doing quite well. According to Pierre-Alain, our mountain biking guide, he has built a new story onto his house. The second story is wider than the first story - one has to question the structural stability! The house stands 'Insha'Allah', as they say. We were served food on matching, Christmas themed plates and large Pepsi cups. It was a bizarre experience compared to Western restaurants. The perfectly spiced lamb tajine served on them was, however, delicious. After the meal, Mohammed showed us how to make mint tea. I should preface this by mentioning that sugary mint tea is ubiquitous in Morocco, and is drunk after each meal. Learn to like it. Making tea, like a boss. The proper way to make tea involves 3 teapots, a precise mixture of green tea and fresh mint leaves, and large chunks of sugar. Watching him make tea was kind of like watching juggling - pretty impressive. Arriving in Marrakech after 4 days in the mountains is like being woken by a cold glass of water in the face - shocking, but refreshing. We stayed in a traditional Riad on the interior of the walls of the Medina, or old city. Accessing our riad involved a trek through tiny alleyways so convoluted I half expected to find a minotaur at the end. Instead of a half-bull, half-man, we found a Moroccan man and women who spoke broken French and broken English, eager to welcome us into the spacious, open apartment. Bike storage in the open-air courtyard of the riad. Marius shows off his headlamp. From this base we explored the old city. Marrakech's old Medina is best described by sounds. The sound of tiny scooters buzzing by you, honking their horns. The sound of shopkeepers asking you to just come and look at their wares. Snake charmer's flutes. Cheap mosque loudspeakers calling people to prayer five times a day. Tourists haggling with shopkeepers. Locals haggling shop keepers. Arabic, French, English, even snippets of German or once Swedish, all imploring you to buy something. The cacophony of the streets combined with the blazing colors of the plethora of wares in every store and on every street corner make for quite an experience. Just chilling on my scooter. We spent the whole day exploring and shopping for tidbits. I am an extremely weak haggler - I don't want to deprive anyone of their livelihood! Luckily Ingvild and Synne are harder to cheat, and although we probably payed a tourist premium it was still pretty satisfying to haggle a necklace to half of the suggested price. Synne considers how much she's willing to pay for a pair of leather sandals. In stark contrast with the stressful souks (markets) are Marrakech's hammams, or traditional spas. When we discovered that there was a spa literally 20 meters from our riad, Synne, Ingvild and I had to give it a try. We spent 2 hours being steamed, slathered in mud and massaged, and returned thoroughly relaxed. We also found peace our second night in Marrakech, after a full day of sightseeing, in a third floor restaurant far above the bustle of the streets. Across the city rooftops in dark, the Koutoubia Mosque was a beacon of light. Marrakech cityscape by night, the mosque to the far left. Marrakech was a beautiful, really different city - but one day was enough. Why are there so many cats in Morocco? And what do they want? Nice writing, Molly,chip off the old block :-). I love your descriptions, and i can see why it was a fantastic trip!